Boba cuts a deal at a dusty, off-world trading post. A lucky blow set off a chain reaction in a Starfortress above, raining burning shrapnel that claimed three Omegas. Losing visibility, the rest careened through the debris... only to be confronted by the business end of their target: the black T70. Kylo takes the Silencer for a cruise beneath the sun-sapping beam of Starkiller Base. Rey and Wedge. Different eras, but some things never change - like being chased down a tunnel by angry TIEs. 33 pieces of all-original, lovingly made artwork in one explosive deck. 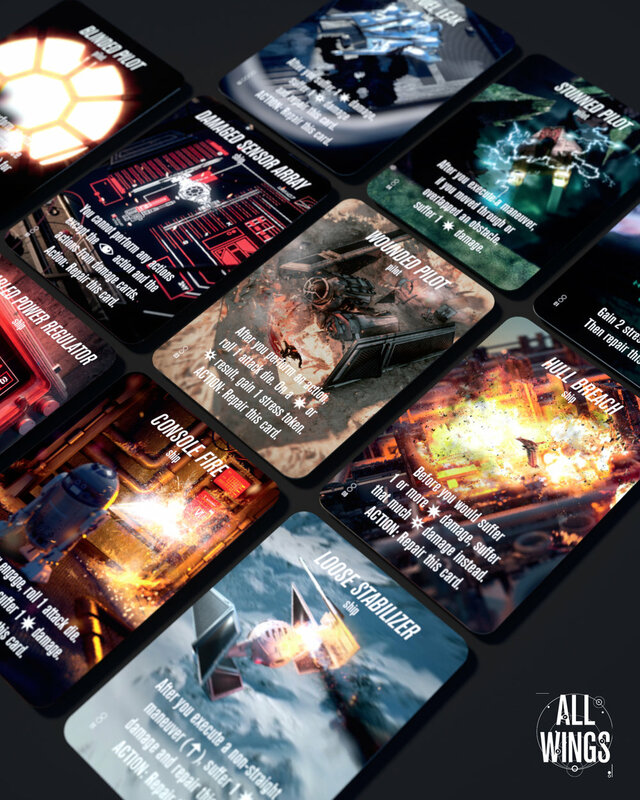 From a Scurgg with loose paneling to the fan-favourite ARC170 spewing black fuel, these cards bring the heat of intergalactic battle to life on your tabletop. Cards are standard ‘mini-american’ sized (because table real-estate is precious)! Luke stood frozen on the muddy bank in front of his X-Wing. A mixture of sweat, swamp bug and self-consciousness made his neck tingle - distracting him from the job at hand. The final glimmer of the Force drained away as the last of his ship slipped beneath the murk. As if protecting all of Concord Dawn wasn’t enough, scouts were picking up a number of unknown ships entering the system on course for Lothal. Perhaps these were some Rebels the Empire had tasked him to keep out? Either way, their affiliation was of little concern. Pirate or Rebel both would be swiftly eliminated. "You're In This Life For Good"
Dice are solid steel finished in antique gold. Ezra facing an impounded ship on Lothal. Fenn cruising through unforgiving landscape. Ezra + Maul Crew — The unlikeliest of companions, trapped in a strange dimension with their Holocrons. (SCUM) Captain Nym tangled in a high-octane chase with the security force in coruscant's notorious criminal underbelly. (REBEL) Captain Nym wreaks death and destruction upon a Trade-Federation bioweapons facility. "All Pilots To Your Ships!" "Flexibility is not synonymous with the Galactic Empire, but the freedom to deploy by hyperdrive into the heart of battle has Rebel command and even local crime lords fearful of the Empire’s new capabilities: squadrons of fully shielded fighters armed to the teeth - able to strike anytime, and anywhere. Recent successful engagements across the dusty stelae of Crait and the rain-lashed plains of Lothal have proven that a measure of flexibility can indeed yield results. With newfound options, we will crush what's left of any who oppose us." - Excerpt from the log of Captain Efraim, Naval Station Validusia. Back to back on a single card, a glimpse into two characters on opposite sides of the force. Rey: Focus, clarity, training on Ahch-To. Kylo: Turmoil, anger, enraged aboard his cruiser. Based on flickering tabletop holo-projector screens, we present the fraught assault on Crait from the perspective of frigate-captains: monitoring the ebb and flow of combat from above. From priority nodes to enemy positions, defensive cannon to iconic rocky trenches; we've designed the little details on this mat to bring your matches to life from a totally new perspective! The man himself, Cruising through an abandoned mining facility hidden in an asteroid belt. "Kill it, if you have to." The final moments of a navigator aboard a doomed Resistance frigate, brutally sucked into the vacuum of space after a devastating strike to the bridge by Ren in his Silencer. In the first of its kind for x-wing: all-new and original scene-art for every crit means drawing enemy fire has never felt better! Chewie's Falcon captured at the exact moment it boosts clear of the crystal cavern, spewing chunks of red rock and crystal dust. You can just about glimpse the depths of the cave it just came through, and the last stray bolts from the pursuing TIEs trail out as they get crushed in the Falcon's wake. "I stand ready to execute our orders, Madam Director"
Vessery trained with ruthless effectiveness, His mere presence in battle was enough to inspire those who followed, and strike fear into his foes. featuring the never-before-seen blueprints of a TIE Aggressor mid-modification. One of the few pilots as deadly outside his ship as he is in it. The plucky pilots of Green Squadron kick up some spray on an urgent mission for the Rebellion. A commission series printed for five friends, with five ships - on the same tabletop. The galaxy's unlikeliest buddies making a harrowing escape through the woods. The Imperial Navy — equipped with harpoon missiles and devastating FAQs — tear the forest up behind them. Your sorry Astromech ejected to its grim fate, just to save you from yours. Sabine escaping from a Destroyer in her stolen TIE, Rex bringing the pain with Phoenix Squadron, Zeb slinking around in Lothal and Ahsoka, entangled in a chase with her old master. Featuring R3A2, dealing with the stress as the Rebel base on Hoth comes under fire, R4D6, putting out a fierce blaze and R5P9, deflecting bolts from pursuing ties. A Y-Wing taking names, clearing a path for its bombing run over Scarif's shield-gate. Two of the galaxy's most formidable pilots going head-to-head against odds no-lesser pilot would survive! The Millennium Falcon makes a quick escape from the mouth of a hungry Exogorth!